The great promise of “social fundraising” is the ability to reach more people, in less time, through popular online platforms like Facebook or Twitter. In theory, this expanded reach should lead to increased participation and higher fundraising returns. In practice, it doesn’t always turn out that way. Like all other forms of fundraising, social fundraising can be done well or it can be done poorly. From our perch here at Classy, we’ve been able to observe some of the factors that distinguish faltering social fundraising efforts from successful ones. Keep the following tips in mind the next time you try to raise money through social media. It seems straightforward enough. It seems like it should work. Unfortunately, it usually doesn’t. There’s a common psychological phenomenon called the “bystander effect” that happens when a group of people collectively fails to help someone in need. We’ve all heard stories of people needing medical attention being passed by throngs of seemingly uncaring pedestrians. The problem is that the people passing by tend to think, “It’s not a big deal if I don’t help, there are so many other people here that someone inevitably will.” With everyone thinking this way, no one winds up helping. That’s the bystander effect. Something similar to the bystander effect appears to happen in the social fundraising context when fundraisers only rely on direct asks. If you put an appeal for donations out to your 500 friends on Facebook, it’s easy for each individual friend to ignore the request because they assume that one of the other 499 people will help you out. While direct asks absolutely have a place in social fundraising, to really pay off, they need to be integrated into other, more effective, strategies. The Tag and Thank approach is great because it lets you reap the benefits of another common psychological phenomenon- social influence. Whether we like it or not, we all have a deep drive to conform to the reactions of our peers. When you use the Tag and Thank approach, you are starting out by letting everyone know that people are already donating to your page! By presenting things in this positive way, you are able to use social influence to your advantage. As your friends see you recognizing more and more donors (people that they likely also know) they will be pushed more and more to get involved. If I see my best friend, or that girl I admire, making a donation to your fundraising page, I’m going to be more likely to make my own contribution. Another great approach is to issue regular fundraising progress updates through your social media accounts. 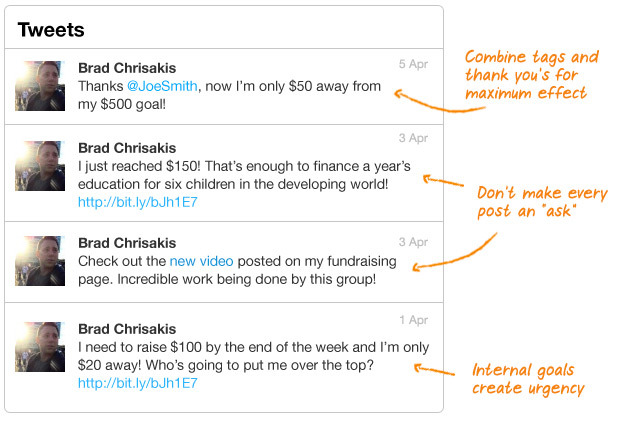 When you pair this approach with internal fundraising goals, you can really start to improve your social fundraising results. When people tune into your regular progress updates, on some level they begin to follow your “fundraising story.” They become more interested in your success or failure. Instead of repeatedly asking them for money, you are documenting your progress for those involved in your life to see. Framing things this way helps people feel connected to your efforts and can lead people who wouldn’t otherwise contribute to get involved. Combining the Tag and Thank approach with the Update approach and the Gift Grab Bag approach can really supercharge your social fundraising. While each technique works well in isolation, they work even better in combination. Whether you’re an individual fundraiser or a nonprofit, give them a try in your next social fundraising campaign. We think you’ll be happy with the results!